Precious metals futures advanced Thursday. In notables, gold posted its tenth straight session increase, silver moved ahead for a seventh session in a row, and palladium closed at an all-time high. Gold for February delivery settled up $3.10, or 0.2%, to $1,321.60 an ounce on the Comex division of the New York Mercantile Exchange. The settlement was the highest since Sept. 15 when prices ended $1,325.20 an ounce. "Now, traders and investors are looking ahead to Friday’s U.S. employment report from the Labor Department. This report is arguably the most important U.S. data point of the month," Jim Wyckoff, a senior analyst at Kitco Metals Inc., said in a daily bullion report. "However, a beat to the upside on this report could dent bullish enthusiasm in the precious metals markets, on notions the Federal Reserve would be more likely to raise interest rates at a faster pace. However, it’s my bias that rising U.S. interest rates are pretty much factored into the marketplace for 2018." 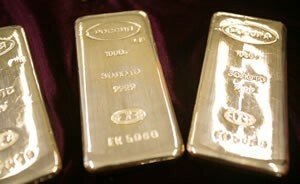 Gold futures traded from a low of $1,307.10 to a high of $1,327.30. They edged up 0.2% on Wednesday and rose 0.5% in their start to the new trading week on Tuesday. Meanwhile, silver for March delivery added 0.2 cents to settle at $17.269 an ounce. The close remains the highest since Nov. 17 when prices settled at $17.373 an ounce. Silver futures ranged from $17.02 to $17.32. They climbed 0.4% on Wednesday and advanced 0.4% on Tuesday. April platinum gained $7.90, or 0.8%, to $970.20 an ounce, trading between $949.10 and $971.50. Palladium for March delivery moved up $11.40, or 1.1%, to $1,094.75 an ounce, ranging from $1,075.90 to $1,101.70. "We see palladium prices remaining well supported, although there is a danger from here of a short-term pullback as investors take profits," Reuters quote Mitsubishi. Gold dipped 40 cents, or less than 0.1%, to $1,314.50 an ounce. Silver added a half penny, or less than 0.1%, to $17.13 an ounce. United States Mint bullion sales were unchanged. Below is a sales breakdown of U.S. bullion products with columns listing the number of coins sold during varying periods. Products with an asterisk (*) are no longer available.